Stress makes it harder for your dog's body to recover after surgery or trauma, so the less stress the better! 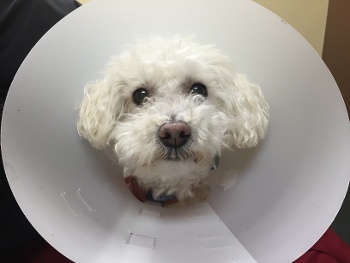 With some simple conditioning, it will be much easier on you to put the cone on your dog any time they might need it — whether it's post-op, after an injury, or if you're using an Elizabethan collar to help prevent licking or chewing due to skin issues. And if you take some time to teach your dog some body awareness and how to move around while wearing this giant lampshade, you'll save your furniture and knick-knacks from being knocked all over the place. 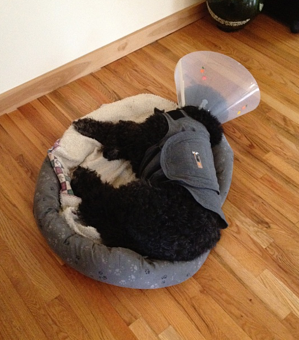 It's easy to help your dog feel more comfortable wearing a cone! If you know they have a surgery coming up soon (such as a spay or neuter), ask your veterinarian for a cone to use for desensitization a few weeks ahead of time. Hold the cone, or place it on the ground in front of you — but do not try and put it on your dog in any way. Reward with a treat any time your dog shows interest in the cone. Any time they sniff, touch it with their nose, or even just look at it, praise and give a treat. Keep this session short and fun. Repeat as necessary until your dog shows no fear or stress when in the presence of the cone. Now hold the cone with the wide opening facing your dog (backwards as far as the dog is concerned). Praise and treat for any head movement into the cone area by your dog. You can encourage this by luring the dog with a treat in your hand and reaching through the neck opening of the cone. If your dog is tentative about putting their head into the cone space, that’s okay! Just go slow and reward for small increments. Repeat as necessary until your dog is comfortable with placing their head in the wide opening of the cone. Switch to presenting the cone with the small opening facing your dog (the correct way). Praise and reward for any movement they make to put their nose through the opening. You can encourage them by luring with a treat in your hand, reaching through the opening, and having them to follow it through as you pull it back towards you. Repeat as necessary until your dog is comfortable placing their head through the smaller opening. Start to add duration and praise and reward for your dog keeping their head in the cone longer and longer. You can start to clip the collar closed, reward, and then immediately unclip. Continue to increase the duration your dog is wearing the cone. Add in rotating the cone around their head while they’re wearing it. Reward heavily throughout. Add tapping on the cone to the routine on the inside and outside, which helps your dog get used to the different sounds they will hear while wearing the cone. Walk around with your dog while they’re wearing the cone to help familiarize them with the environment and learn how to maneuver with it on. Encourage them to keep their head up while walking to avoid catching the cone on the carpet or floor. Help them maneuver through doorways and around corners so they can acclimate to the different movements. Keep each session short and sweet, about 3 to 5 minutes long. Or you can count out a certain number of treats (20– 30) and end the session after you've used them all up. The goal is for your dog to view the elizabethan collar as something neutral or positive — not something to be scared of or run away from. By pairing it with fun, food, and praise, you prevent the cone from becoming an additional stress on your dog during their recovery. Did you know that you can also help your cat get used to wearing a cone? If you have a cat, check out our article Your Cat in a Cone: Elizabethan Collar Desensitization to see how to go about it!